Dragons, Dragons, and more Dragons! 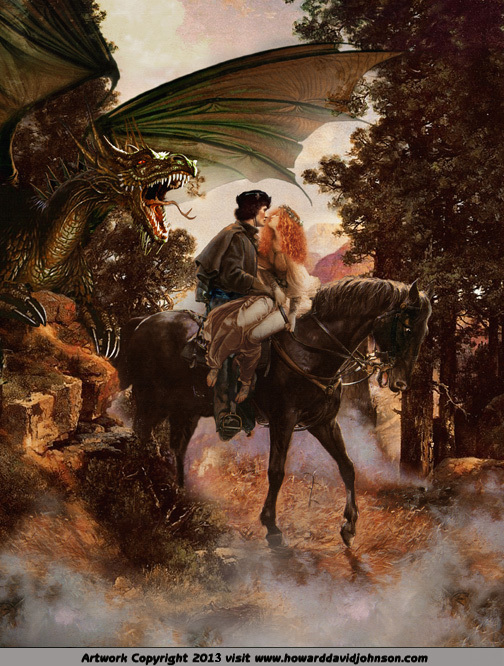 Welcome friends to the Realistic Draconian Fantasy Art Gallery of Contemporary American Illustrator Howard David Johnson, whose illustrations of Mythology have been published all over the world by distinguished learning institutions and publishers including the Universities of Oxford and Cambridge. 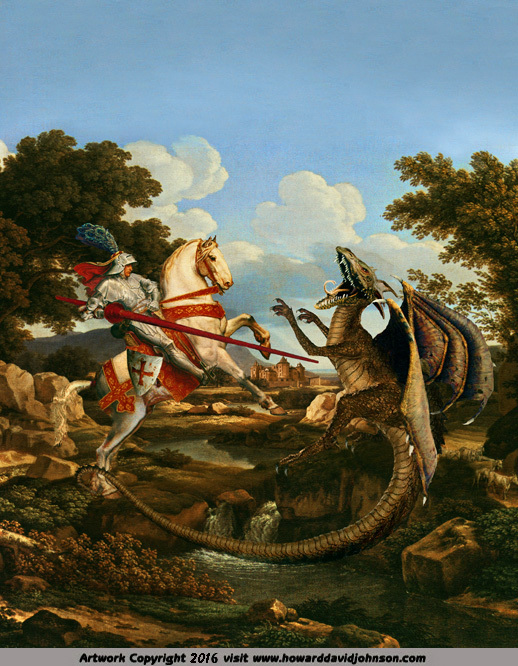 If You love paintings and pictures of Dragons, You've come to the right place! A Gallery of New Paintings, Drawings and Pictures from World Mythology in traditional oils, Contemporary acrylics and cutting edge digital mixed media in the visual style and story telling tradition of the classic illustrators. 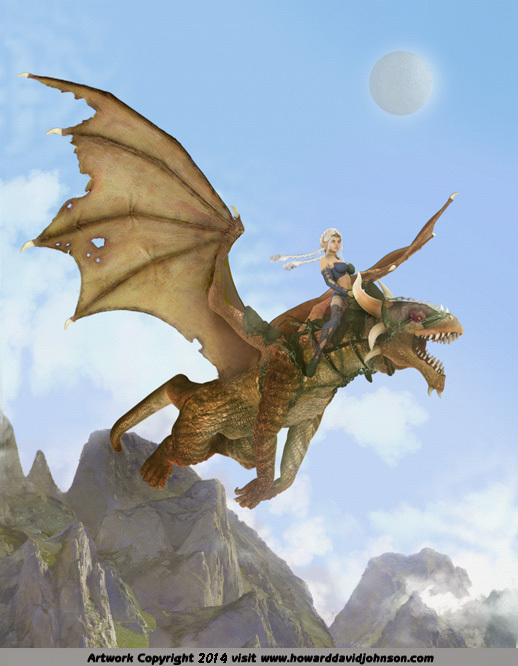 And now... A World of Dragon Art! Wiverns, Drakes, Verms and more! 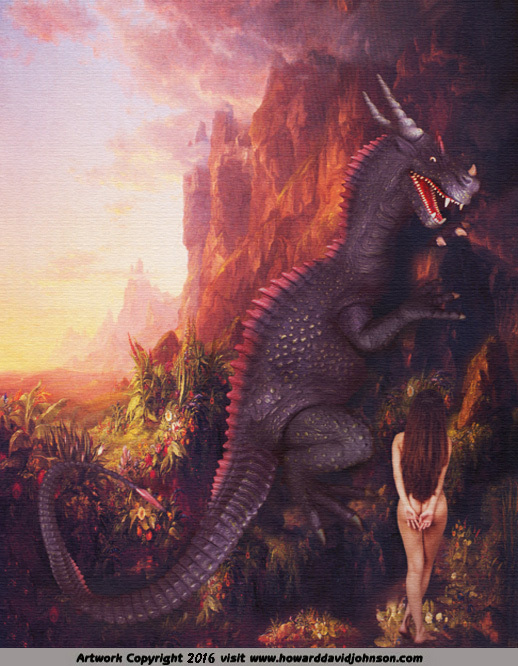 The Dragon has played an important part in the myths and religions of mankind since pre-historic times... Although regarded as a sacred guardian by many of the ancient cults the dragon has been more commonly symbolic of the principle of evil. Living Dragons ~ In recognition of myth more than forty species of tree- dwelling lizards inhabiting Southeast Asia, the Philippines, and the East Indies carry the name Draco, which in Latin means Dragon. These 'flying dragons" glide from one tree to another. The dragon lizard of Kimoto is the largest dragon in existence today. 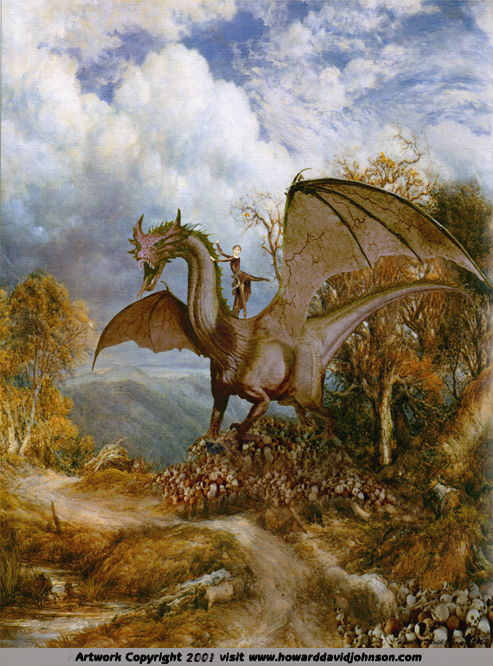 In English legend, Uther Pendragon, father of King Arthur had a vision of a dragon that was considered a mighty omen. Uther began a tradition of using their war like and terrible effigies as standards, carrying them into battle to "strike fear into the hearts of the heathen." 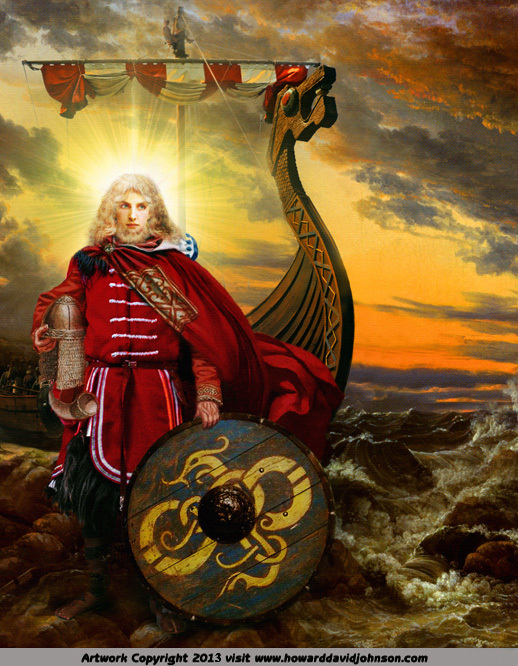 They were painted on shields and the Vikings carved Dragons heads onto the prows of their ships. The Welsh Dragon or "the Red Dragon" or "Y Ddraig Goch" in Welsh, is the symbol of Wales and adorns its national flag. 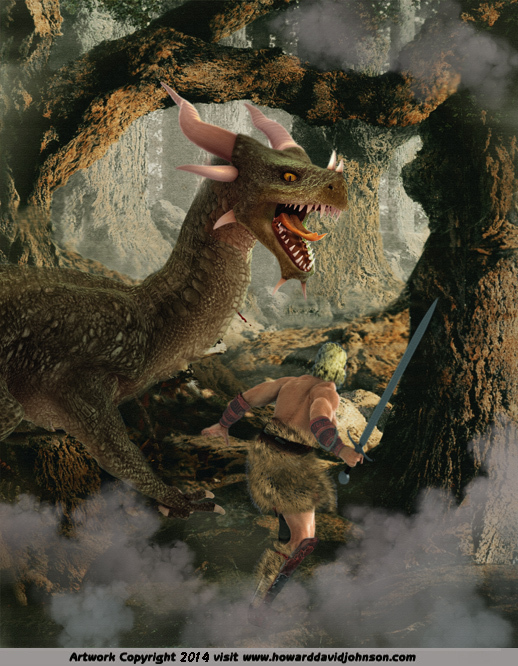 This dragon was featured on the legendary battle standards of King Arthur, the heathen Celtic gods and historic chieftains and kings. 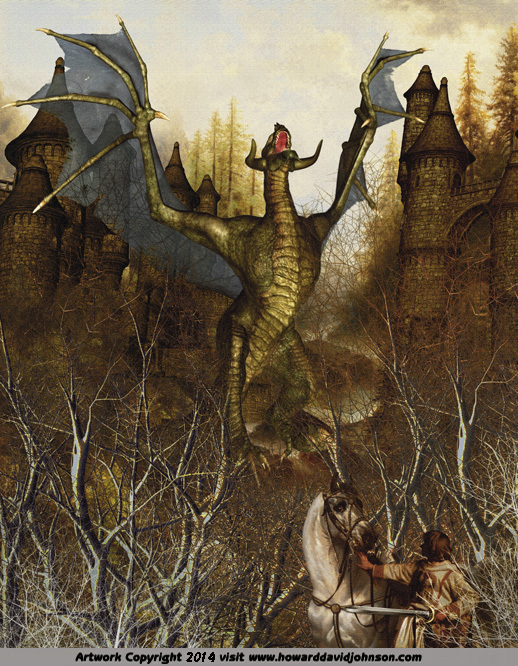 In the treasured ancient Mabinogion legends the red dragon fights an invading White Dragon. 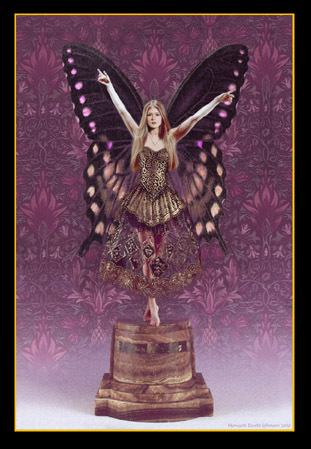 For centuries their castle walls were demolished nightly by these spirit beings. 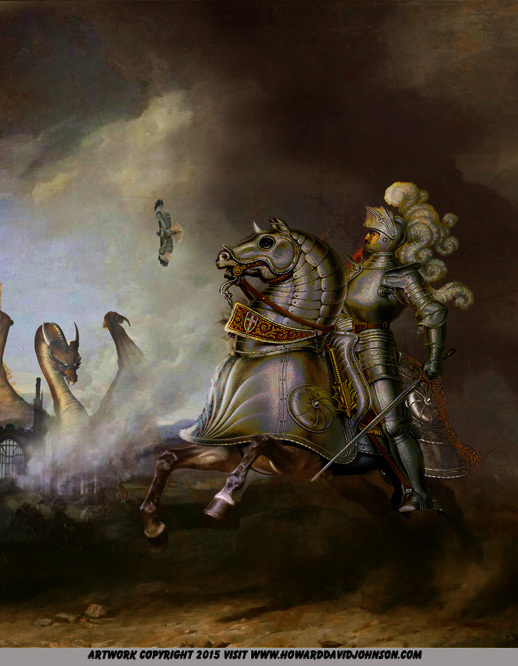 The legendary fight was said to symbolize the struggle between the Welsh and English and prophesied that after years of tyranny the Welsh would drive the English from their homeland. 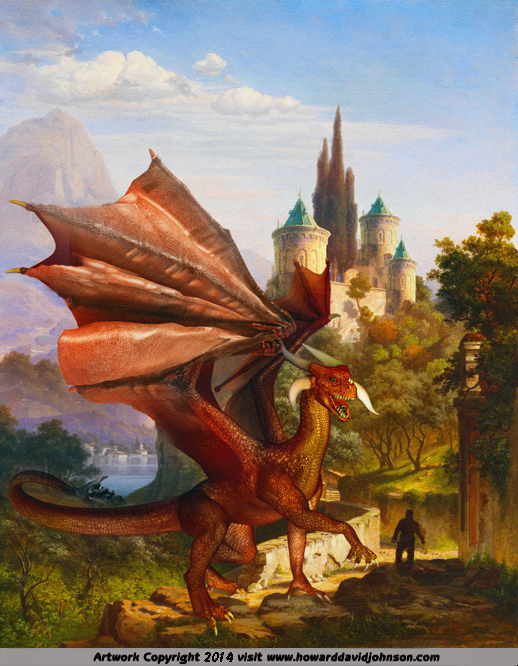 In the search for a special boy to offer as a human sacrifice to rid them of this pestilence, the boy Merlin is found and through strange twists of fate becomes one of the greatest dragon masters of the Celtic legends where his vision of the red dragon is a prophecy of the coming of King Arthur. Arthur's father was known as Uther Pendragon or the “Dragon Chief." 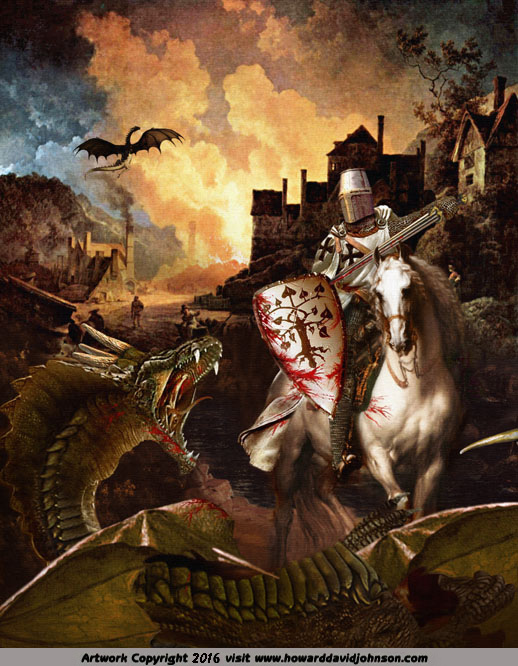 In factual history Henry VII [or Henry Tudor] flew a red dragon of Cadwaladr ap Cadwallon on his battle flag, The earliest recorded used of the red dragon as a symbol of Wales is in the 'Historia Brittonum'. The red Dragon was first brought to Great Britain during the Roman era and history tells us they first learned of it from the Persians. The Red Dragon or 'draco' symbol was used as a standard by the Roman army but over time it was adopted by the Welsh people as their national flag. It is the oldest extant national flag flying today. 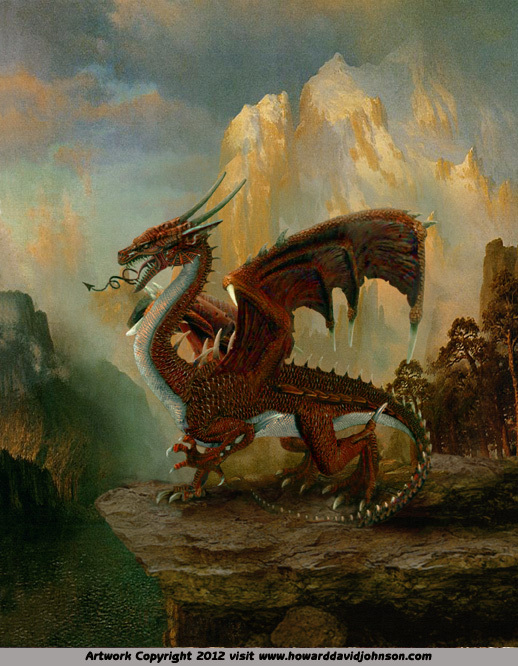 The great Welsh king, Cadwaladr, carried the dragon standard as a symbol of bravery and fierceness. Welsh princes and warriors continued the tradition. In 1346 during the Battle of Crecy Welsh archers in the English army carried the same standard. Henry Tudor, who was descended from Cadwaladr, carried a banner with a Red Dragon into the Battle of Bosworth Field in 1485. When he became Henry VII he decreed that the red dragon should adorn on Welsh flag. In 1959 Queen Elizabeth II declared that the red dragon on a green and white field should become the official symbol of Wales and thus this time honored legend is still vibrant and alive in the 21st Century. 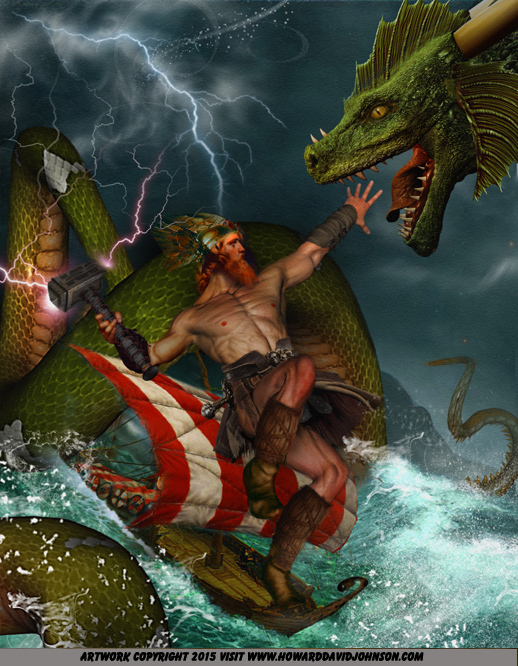 The Great Dragon slayer of Nordic myth, Siegfried, slayed the dragon, Fafnir as a young man, and seized the Ring of the Neiebelung. 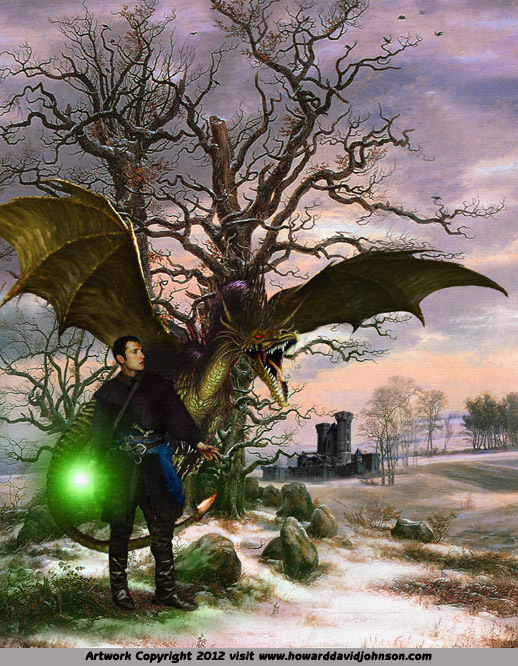 A bath in the dragon's blood made him impervious to injury everywhere save one small spot where a leaf clung to his back. 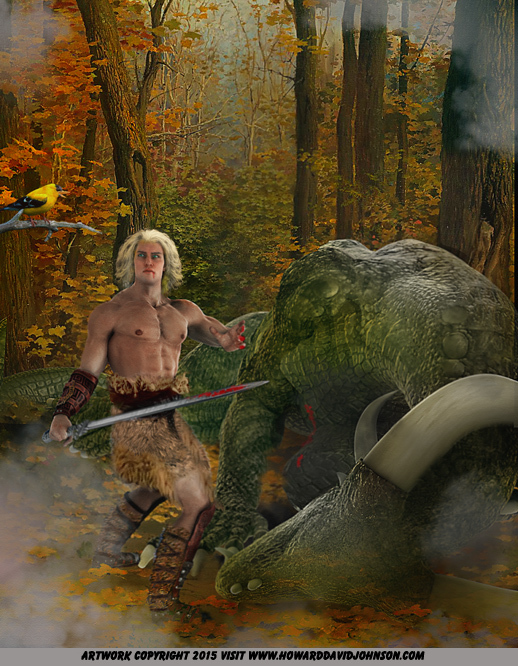 He accidentally tasted Fafnir's blood which gave him the power to understand the forest birds. 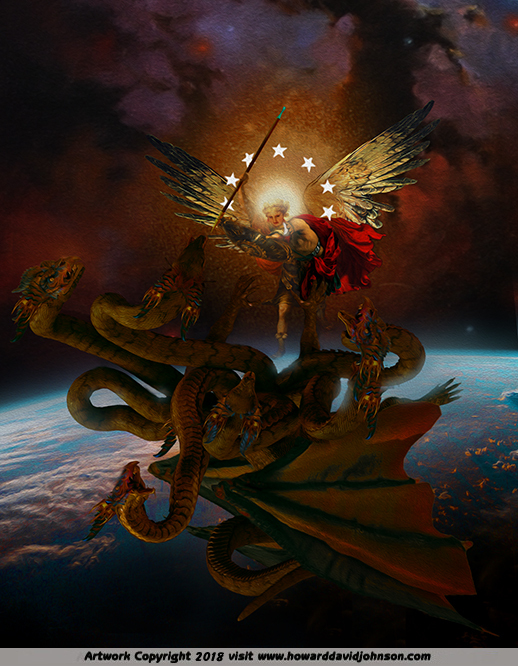 The First dragon appeared to the mythical emperor Fu-hsi, & filled the hole in the sky made by the monster Kung Kung. Its waking, sleeping and breathing determined day & night, season and weather. 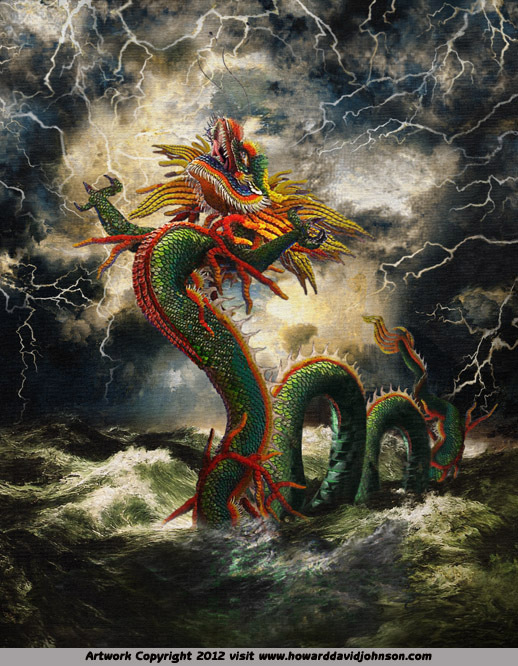 There are many differences & similarities between the Classical dragon & the Chinese dragon, these include the ability to fly even without wings, shape-shifting abilities,& of course the general benevolent behavior to the populace. The Chinese dragon is made up of nine entities. The head of camel, the eyes of a demon, the ears of a cow, the horns of a stag, the neck of a snake, it's belly a clam's, it's claws that of an eagle, while the soles of his feet are that of a tiger, and the 117 scales that cover it's body are that of a carp. The Chinese dragon has four claws as standard, but the Imperial dragon has five, this is to identify it above the lesser classes. Anyone other than the emperor using the 5 claw motif was put to death. 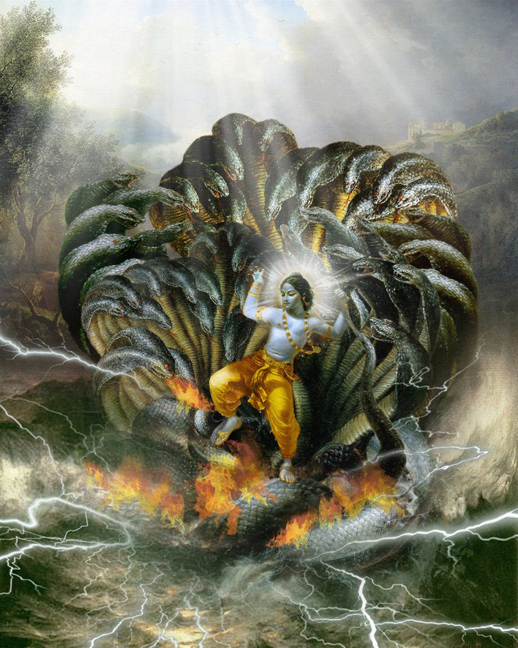 The Chinese dragon (Lung) was a divine bringer of rain, necessary for the good of the people. 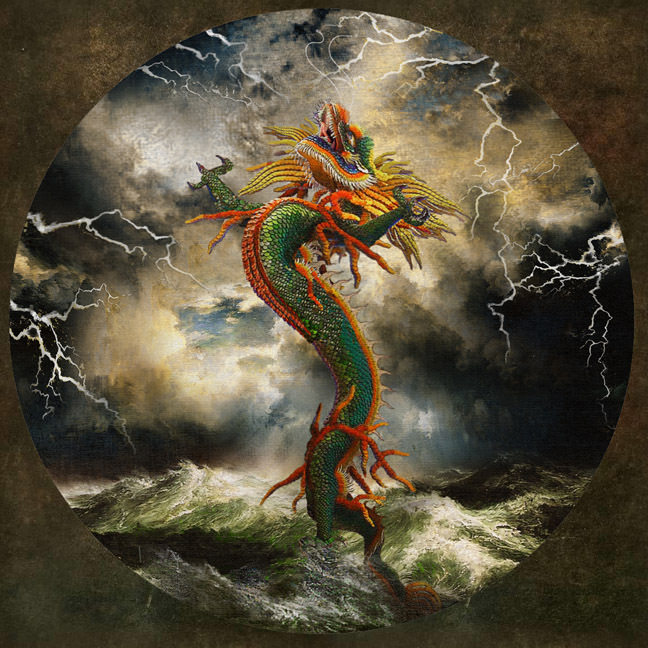 Throughout Chinese history the dragon has been equated with weather. 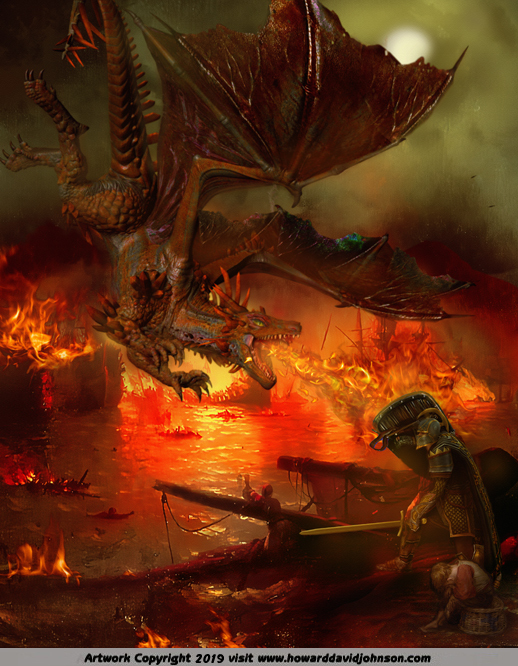 It is said that some of the worst floodings were caused when a mortal has upset a dragon. 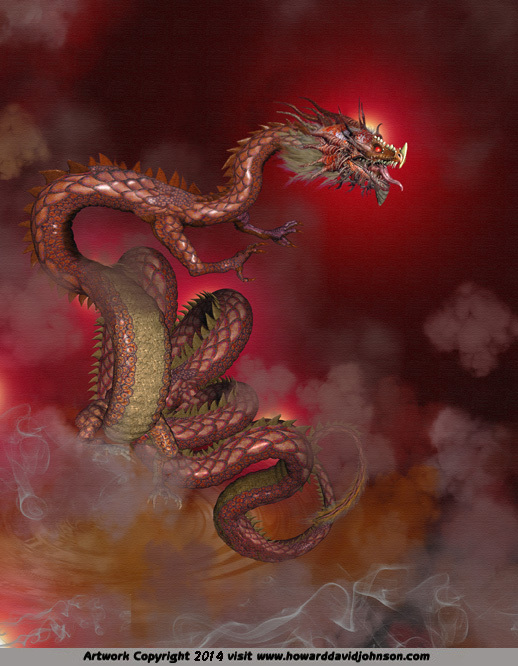 Chinese dragons of myth could make themselves as large as the universe or as small as a silkworm. They rise to the skies in the spring and plunge into the waters in autumn. They could also change color and disappear in a flash. The dragon was also a symbol of the emperor whose wisdom and divine power assured the well-being of his subjects. 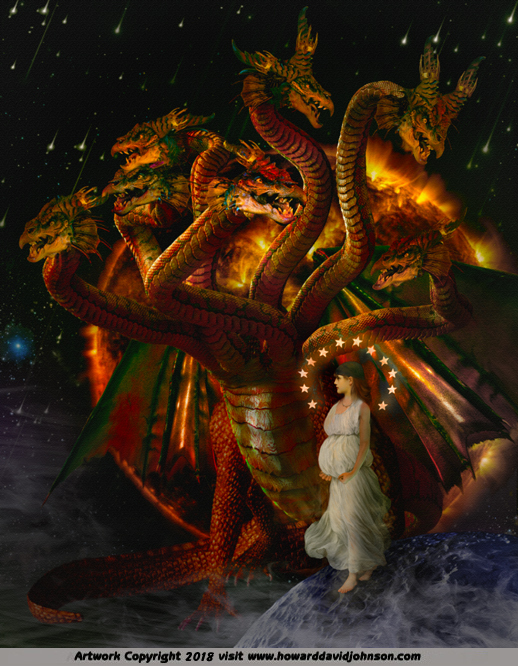 Many legends draw connections between the dragon and the emperor. 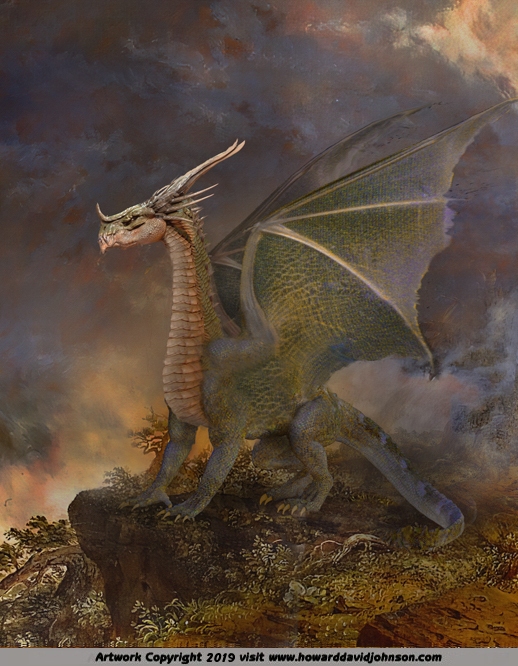 Some emperors claimed to have descended from the dragon. 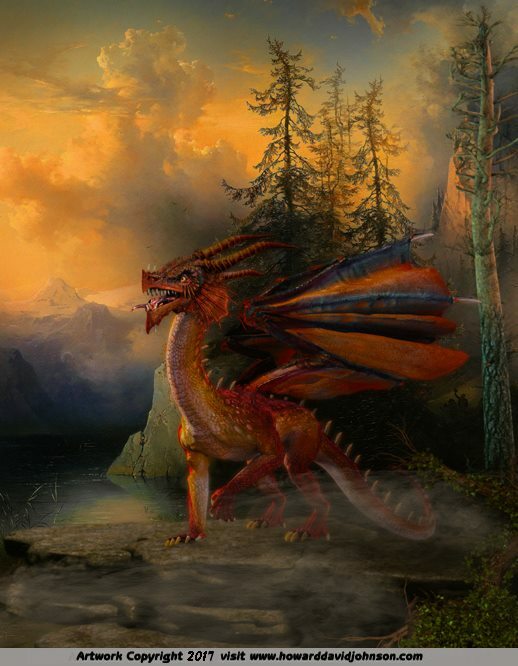 According to legend the Dragon had nine sons, and each had a strong personality. There is no general agreement as to what the Dragon's sons are called. However, to most people, they are: 1.Haoxian A reckless and adventurous dragon whose image can be found decorating the eaves of palaces. 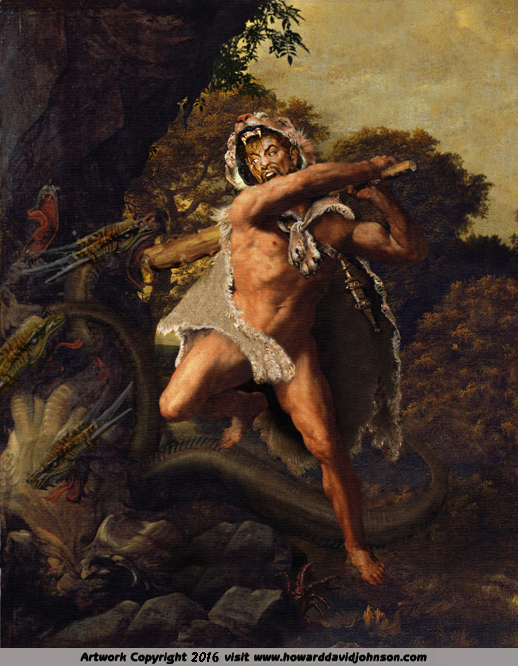 2.Yazi Valiant and bellicose; his image is seen on sword-hilts and knife hilts. 3.Chiwen Chiwen likes to gaze into the distance and his appearance is often carved on pinnacles. 4.Baxia Baxia is a good swimmer and his image decorates many bridge piers and archways. 5.Pulao Pulao is fond of roaring and his figure is carved on bells. 6.Bixi Bixi is an excellent pack-animal whose image appears on panniers. 7.Qiuniu Qiuniu loves music and his figure is a common decoration on the bridge of stringed musical instruments. 8.Suanmi Suanmi is fond of smoke and fire; his likeness can be seen on the legs of incense-burners. 9.Jiaotu Jiaotu is as tight-lipped as a mussel or a snail. His image is carved on doors. Nine Dragon Wall A very popular tourist site in Beijing is this Nine-Dragon Wall in BaiHai Park. After hundreds of years, the colours of the ceramic tiles are just as brilliant. The wall was built in 1756. It is 21m long, about 15m high and i.2m thick. It is faced with 424 7-colour ceramic tiles. 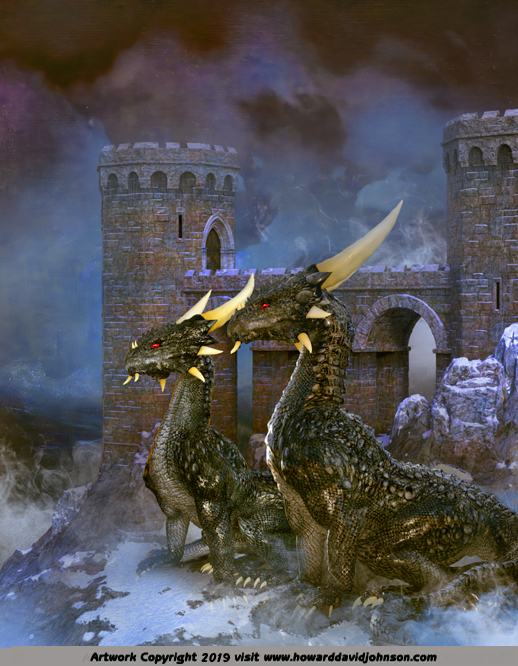 At the centre of the wall, there is a giant dragon, flanged by four dragons on each side. In addition to these nine large dragons, the wall is covered from edge to edge with many smaller dragons. 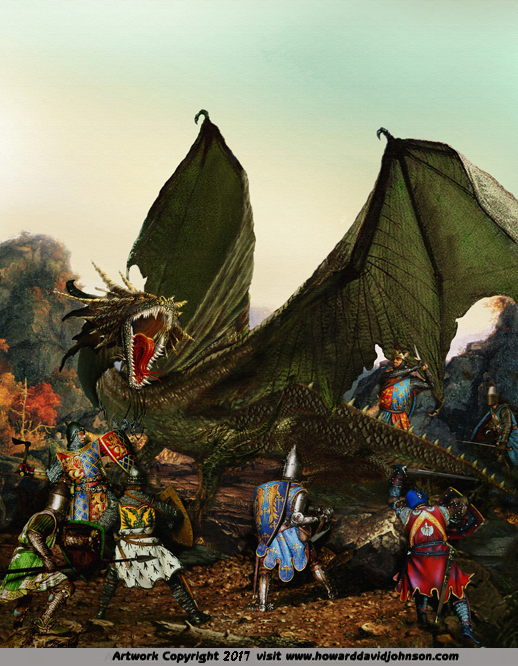 In all, there are 635 dragons. The Ancient Chinese Dragon occupies a very important position in The mythology of China. It shows up in arts, literature, poetry, architecture, songs, and many aspects of the Chinese conscience. The origin of Chinese dragons is unknown, but certainly pre-dates any written history. A Dragon legend from India;"Krishna and Kaliya the Demon Serpent" MMXI [left] In this story Krishna, the ultimate manifestation of the Hindu God-head is exorcising a ferocious malevolent entity in serpent form who had terrorized the villagers, poisoned the waters, and killed all the nearby wildlife - even birds flying by overhead. 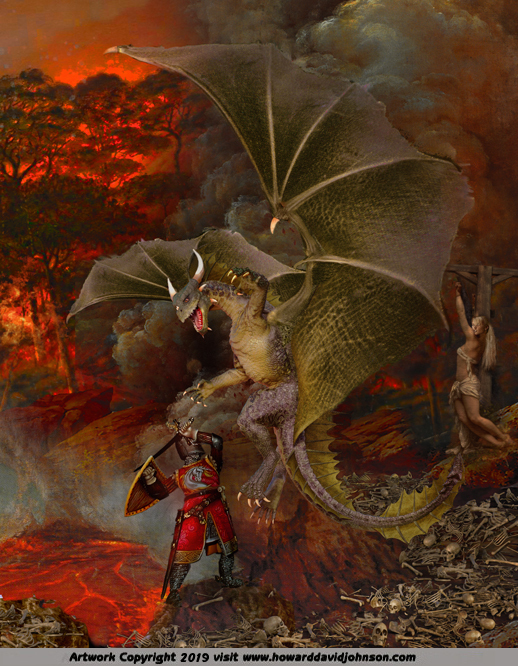 Dragons were usually seen as a power of evil, and the slaying of a dragon the crowning achievement of heroes. 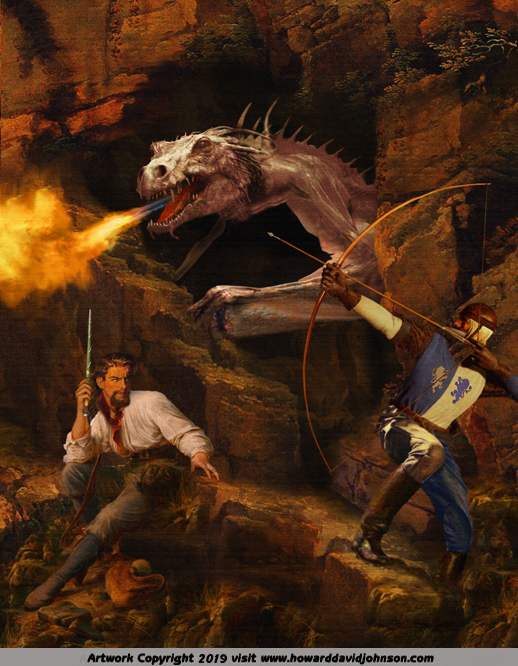 Siegfried, Siegmund, Beowulf, Arthur, Tristram, and even Lancelot the "beau Ideal" of Medieval chivalry were all dragon slayers... but Dragons were also at times conceived as beneficent powers - sharp eyed dwellers of the innermost portions of the Earth, wise to discover it's secrets and utter them in oracles, or powerful to invoke as guardian Genii ( Djinn ). (nēd'hœg-arr) is an illustration based on the prose and poetic Edda of Norse mythology, compiled and written in the 13th century from surviving traditional sources by Snorri Sturluson. 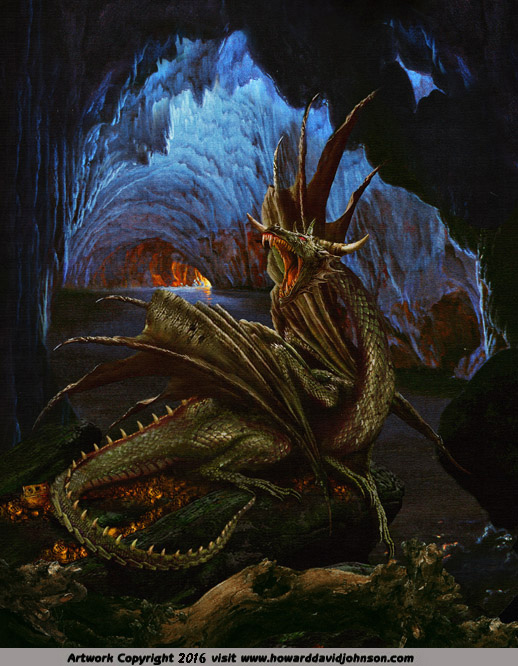 Here the serpent is shown in an icy subterranean cavern roaring in defiance before returning to gnawing at the root of the world tree, named Yggdrasill. 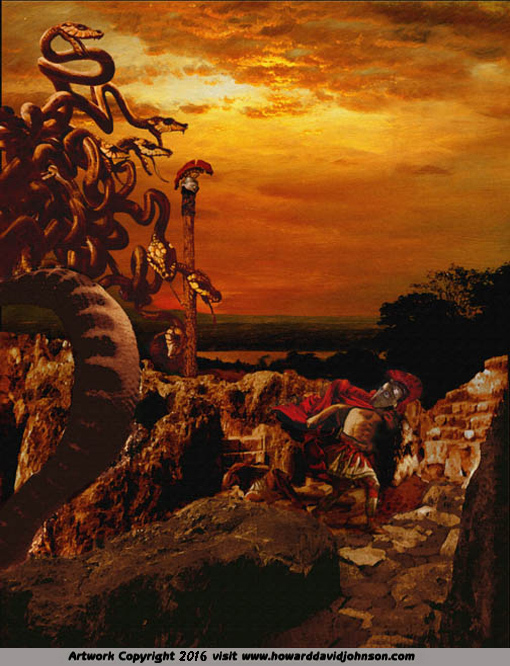 In Norse myth, Nidhoggr or"the tearer of corpses" is a gigantic and monstrous serpent-like creature that gnaws continually and persistently at the deepest root of the World Tree, threatening to destroy it. 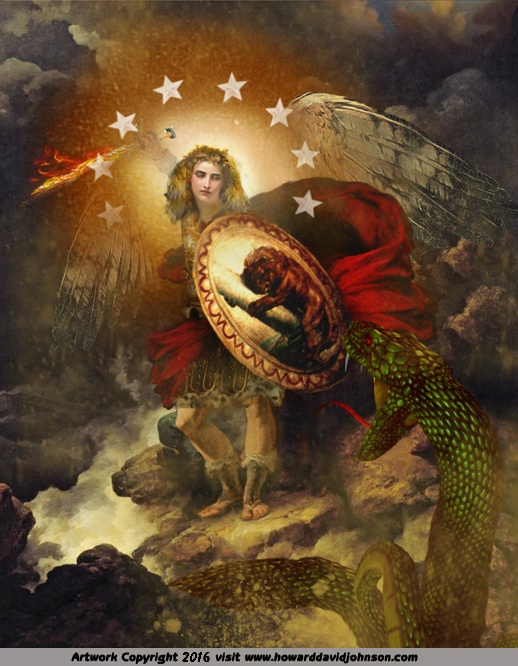 The serpent is always bickering with the eagle that resides near the highest part of the tree. 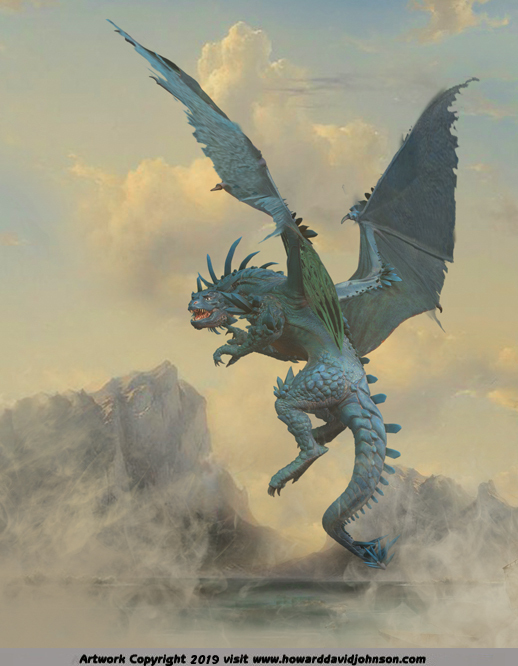 Nidhoggr lies on Nastrond in Miflhiem and eats corpses to sustain itself. It is not the only serpent whose mission it is to destroy the World Tree; the other dragons include Grafvolluth, Graback, Goin and Moin. Yggdrasill (Old Norse: Ig-ID-rass-il). The immense world tree is at the very center and heart of Norse cosmology; and surrounding the tree are nine worlds. The gigantic ash tree is extremely sacred. The gods go to Yggdrasil daily to hold court. The branches of Yggdrasil reach up into the heavens, and the tree is fed by three roots that extend far away; one to the well Urðarbrunnr, one to the spring Hvergelmir, and another to the well Mímisbrunnr. 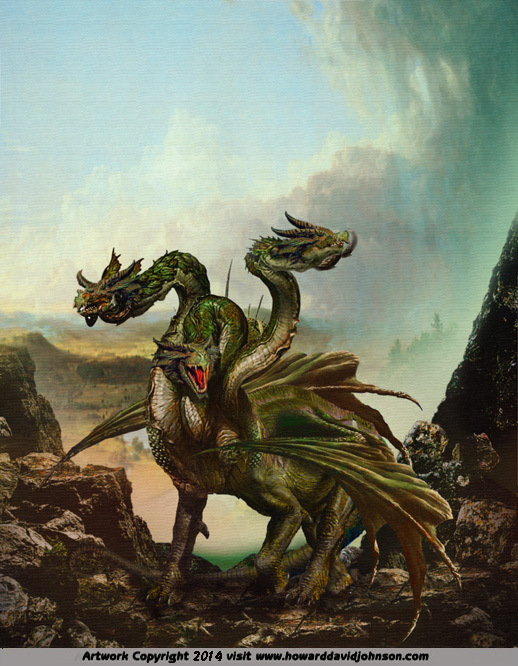 Many creatures live within Yggdrasil, including the wyrm (dragon) Níðhöggr, Odin's mystical eagle, and the stags Duraþrór, Dáinn, Dvalinn, and Duneyrr . 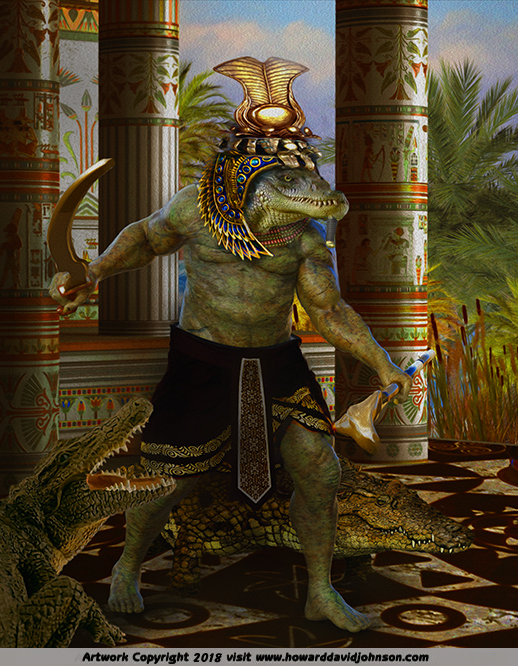 Howard David Johnson is a visual artist and photographer with a background in the natural sciences and history who works in a variety of media and with themes inspired by classic illustrators. Some of his more prestigious clients have included the University of Texas, the Book of the Month Club, Paramount Studios, PBS TV, Adobe Photoshop Auto FX, and J Walter Thompson Advertising. 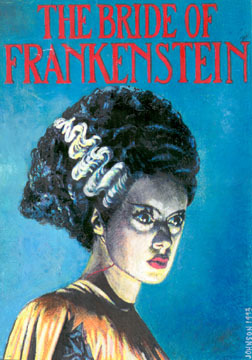 Licenses to print his existing work are available at surprisingly affordable prices. Oil Paintings, Colored pencils, Pastels, Mixed media, and Digital art can also be commissioned for select projects - Click on commission new art below... Working in a variety of traditional and cutting edge digital media he offers his customers a variety of options and more than thirty years of experience. 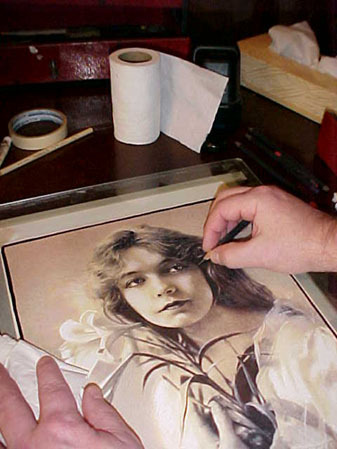 His favourite medium for realistic art was colored pencil because of the high speed and low expense, and people began expressing difficulty in telling his colored pencil drawing from photographs in the early 1980's. 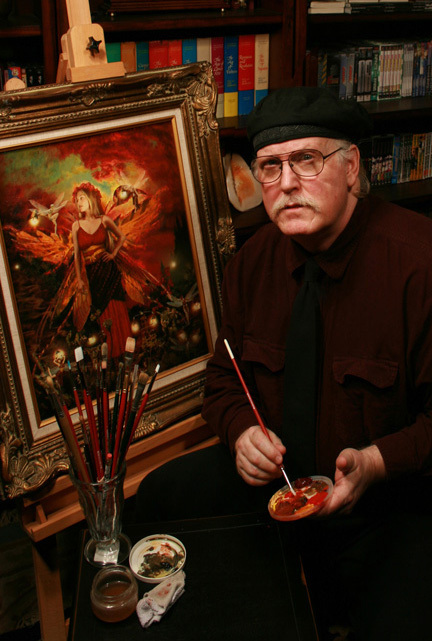 In the last 35 plus years he has also mastered Oils, Pastels, Acrylics, Watercolors, Inks, Scratchboard, Gouache, Photography, and lately the highly controversial digital media, which has become the new favorite . 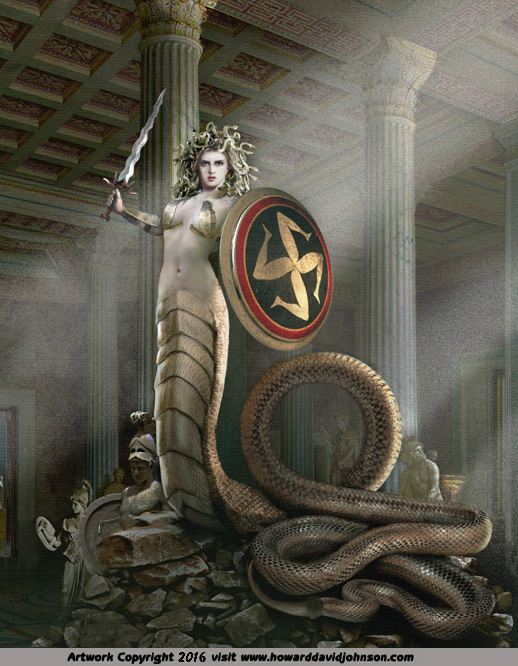 As a commercial illustrator Johnson has not only used the computer to create art but has been involved in the development of computer imaging software for Adobe Photoshop. Working in a realistic style inspired by classic illustrators HDJ is deeply rooted and grounded in the Greco-Roman artistic tradition, Feeling that with realistic art, the human form is the ultimate arena for artistic expression. His lifelong dream came true when his Traditional Realistic Art was exhibited in the British Museum in London England in 1996. 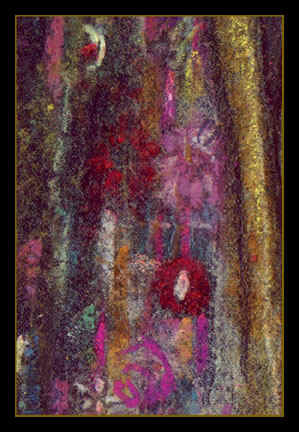 His mixed media has also been displayed in numerous other ones since such as the Metropolitan Museum of Art. Having achieved international acclaim as a traditional visual artist he discovered digital media ( Art Numérique ) in 1999. Because of his passion for realistic art and photography he elected to embrace it and joyfully be a part of this historic era in the visual arts as a 21st century realistic visual artist. 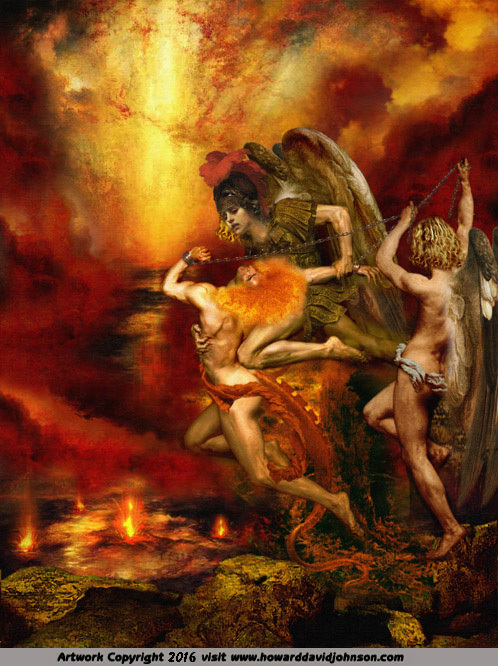 In addition to his mastery of traditional media, Howard David Johnson now combines drawing, painting, photography, and digital media with more than thirty years of experience in these fields to create his Realistic Art Numérique in 21st century paintings and pictures. Did you know the Greek word "Photography" means "Painting with Light"? Today with the advent of computers it truly lives up to it's name. Due to developments in Art and Technology, a broader definition of painting is needed than that which is found in common usage. Announcing Art Numérica -an exciting merger of traditional visual art and cutting edge technology... a new art form for the twenty- first century... Art Numérica is not limited to realistic art but also offers limitless horizons for everything from cartoons to abstractions. 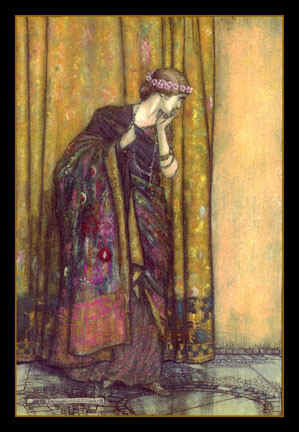 It is the most dramatic development in the visual arts since the Renaissance. In the words of Al Jolson in the movie world's first talking picture" You ain't seen nothin' yet!" Photography, Drawing, Painting and Art Numérica combined The creation of Realistic art has been the goal of most artists since the dawn of civilization. Realistic art was the pride of ancient Greece. The world's greatest museums are full of realistic art. Realistic art WAS art until the advent of the abstract expressionist movement in the twentieth century. 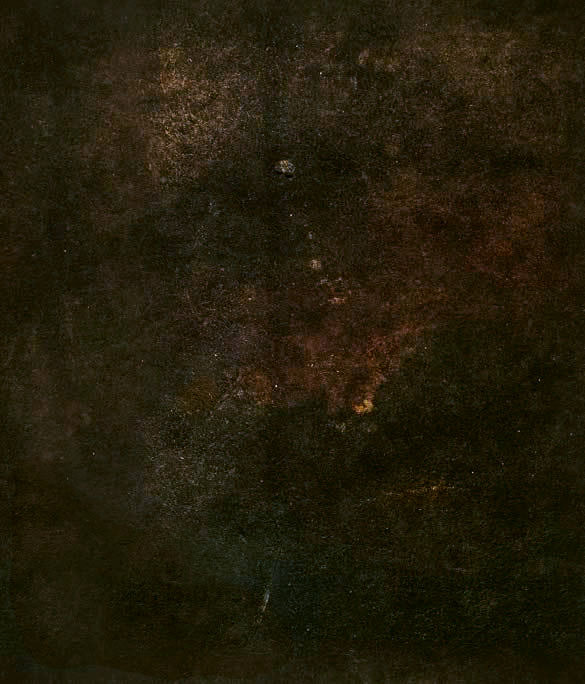 The coming of the camera in the nineteenth century changed realistic art forever. Suddenly, realistic art was not the only way to create realism in portraits and historical records. The work of the realistic artist was suddenly made into an expensive luxury. The political power of the realistic artist was broken and they were no longer an indispensable member of society. Hostility to the creators of realistic art goes back to ancient times and the jealousy of advisers to the Pharaohs and others who were not able to spend as much time with their rulers as their portraitists. Although with the aid of photographs, realistic art achieved levels of excellence undreamed of, the realistic art movement of the late nineteenth century was short. 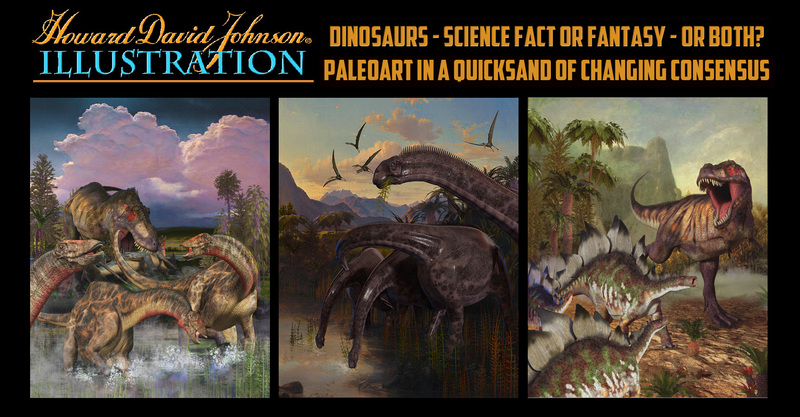 HDJ has four pages of free art lesson previews. Click on The Bride for links to them. After you have seen them, if you would like to still learn more of HDJ's design motifs and further details of his art techniques personal instruction is available for $199.00 U.S. dollars ( $20.00 per lesson ) for one of his in depth ten lesson correspondence courses in college level beginning, intermediate, or advanced drawing, painting, photography, or $1,000 for the digital media course.